With Christmas just around the corner there are so many events to mark on the calendar. It is also the time to pause in our very busy lives and think of those who may be alone over the Christmas Holidays. 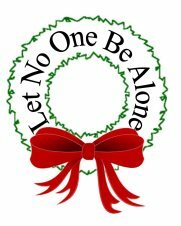 This is the perfect time to remember the sentiments of the “Let No One Be Alone” initiative. Christmas is a happy occasion for most, however may be the worst time of year for those without family and or friends nearby. Possibly the best gift you can give this season is a little bit of your time. If each of us did just one act of kindness and made an extra effort to include someone …well, think of the difference it would make to others.